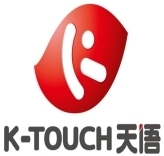 K-Touch is a Chinese Consumer product Brand with a presence in more than 30 countries worldwide. The company was founded in 2007 with its headquarter located in Beijing China. Officially registered as Tianyu Communication Equipment Co. Ltd, Its most successful product is the K-touch line of smartphone. Its line of Smartphones hardware is mostly powered by MediaTek Chipset while it runs Google' Android as its core operating system. K-Touch design, produce and distribute affordable high-end smartphones and accessories, the Brand holds a considerable portion of Chinese, Indian and some African countries mobile Phone market Share.